See also advertising for teenagers. See how a woman wore a belt in a Dutch ad. See a classy 1920s ad for a belt and the first ad (1891) MUM has for a belt. See how women wore a belt (and in a Swedish ad). See a modern belt for a washable pad and a page from the 1946-47 Sears catalog showing a great variety. See the Kotex stick tampon. This was revolutionary. Even though the pad at this time was still thick, the wearer didn't have to hold it in place with a belt (picture), something women mostly hated (although they could wear special underpants to hold pads). 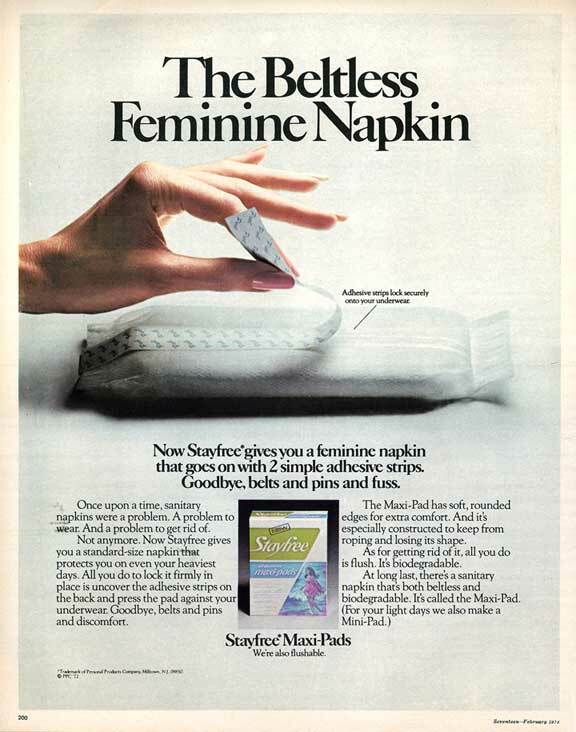 See the other pioneer of beltless pads, New Freedom menstrual pad (Kotex).